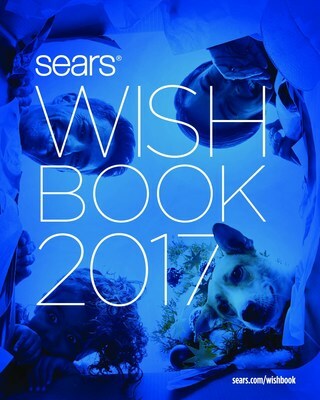 HOFFMAN ESTATES, Ill., Oct. 25, 2017 /PRNewswire/ -- Just in time for the start of the holiday season, Sears has announced the return of the brand's iconic Wish Book, bringing members all of their favorite gifts in one place. Sears reinvented the Wish Book for 2017 – reclaiming its place as the definitive source for hundreds of gift options for every family member, and offering convenient access via mobile, online and the classic print editions to help shoppers easily find quality gifts. "The new 'genie in the bottle' is our Sears Wish Book. From drains to drills to dresses…from tools to TVs to tablets, we've got your back! We know the holiday hustle is on! And we've got you covered with the Wish Book," said Kelly Cook, chief marketing officer for Sears and Kmart. "Our members told us they missed the Wish Book, so we had to bring it back, but in a special way that lets you share more joy wherever you are. There's gifting inspiration on every page to help you live life now – during the holiday season and throughout the year." The 120-page Wish Book, last available in 2011, showcases Sears' breadth of quality products including holiday decorations, home furnishings, kitchen essentials, games and toys, sleepwear and intimates, workshop and outdoor living items, top selling appliances and fashion favorites, home gym, and more. The digital Wish Book is now accessible online or via any mobile device at sears.com/wishbook, as well as through the Sears app. The interactive digital Wish Book provides shopping convenience this holiday season, letting members shop wherever, whenever and however they choose. Members can easily navigate through pages, hover over items to see pricing and descriptions, and click on the heart icon to add to their Shop Your Way member Wish List, making it simple to pick out holiday gifts for family and friends. Pricing is dynamically updated, so members can return to the digital Wish Book throughout the holiday season and ensure they're getting the best deal. Sears' best members will receive a limited edition printed 2017 Wish Book in the mail, and select other Shop Your Way members will receive an email inviting them to pick up a copy of the collectible keepsake at their local Sears store, while supplies last. The first Sears Wish Book, known as the Sears Christmas Book catalog, came out in 1933. Featured items in the first catalog included the "Miss Pigtails" doll, a battery powered toy automobile, a Mickey Mouse watch, fruitcakes, Lionel electric trains, a five pound box of chocolates, and live singing canaries. Join Sears on social media to hear more about the Wish Book and the latest Sears news – "Like" Sears on Facebook, and "Follow" Sears on Twitter and Instagram.